Our ordinance is finally updated in the online muni code database! 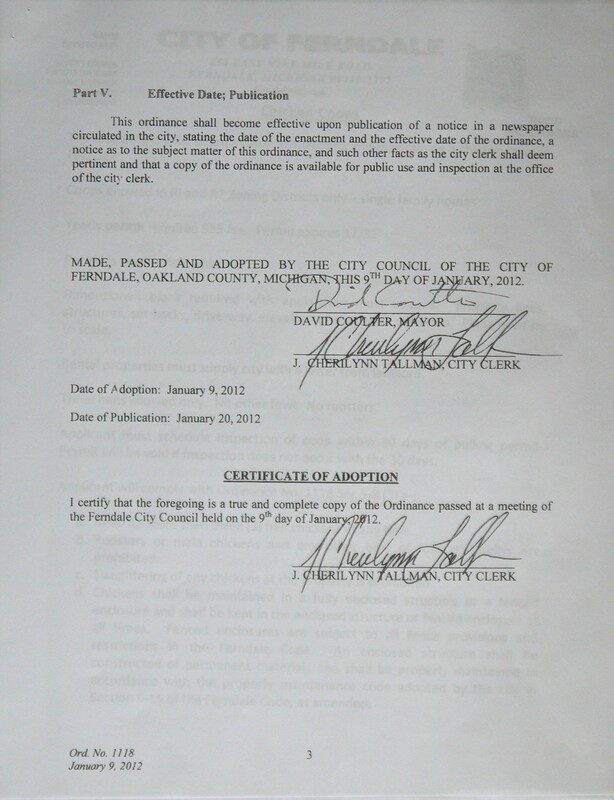 Read the ordinance here in it’s entirety: Sec. 5-8. 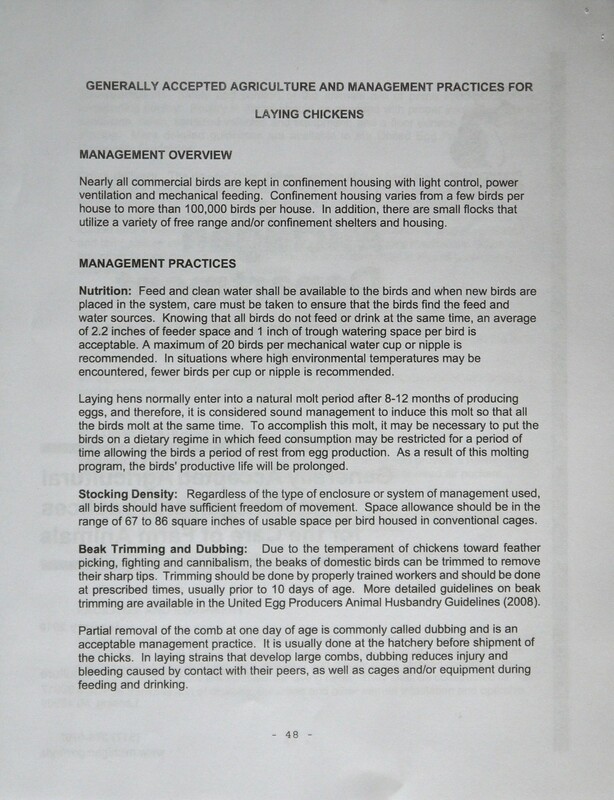 – Keeping of chickens. 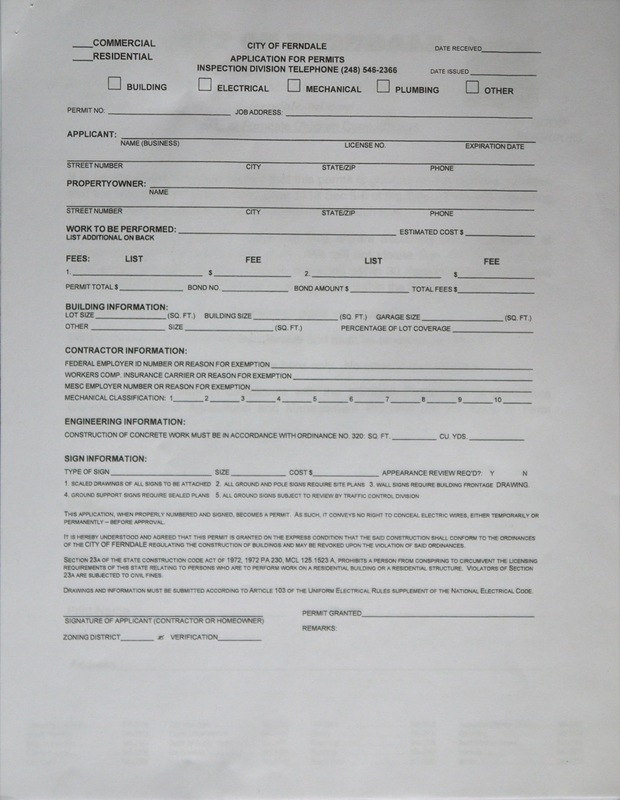 You will need to submit a dimensioned site plan and pay your $35 permit fee at the time you submit your paperwork. The dimensioned site plan must include: property lines, structures, set-backs, drive-way, elevation of coop with materials. Plans must be to scale. Coops are only allowed in R-1 and R-2 zoning districts- single family homes. Rental properties must supply the city with a letter of approval from the landlord. The yearly permit is non-transferable. Three hens allowed only. No other fowl. No roosters. 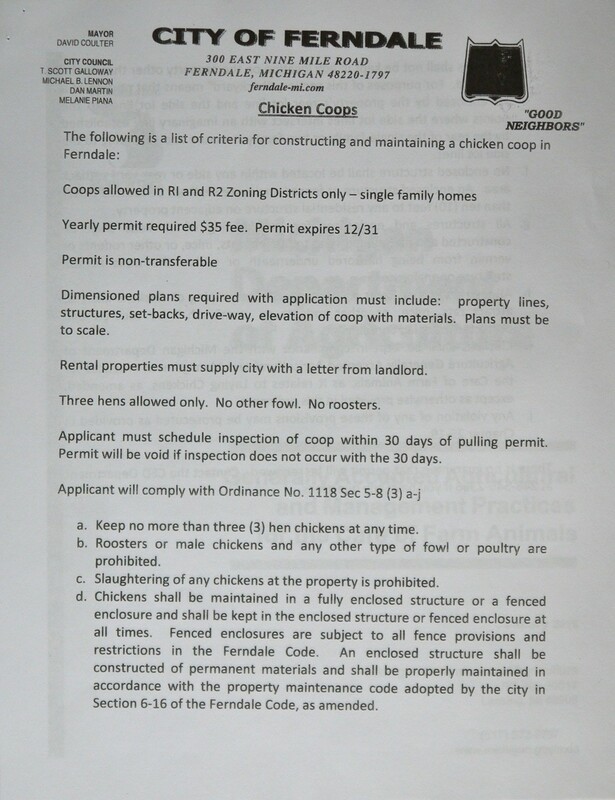 Applicant must schedule inspection of the coop within 30 days of pulling the permit. 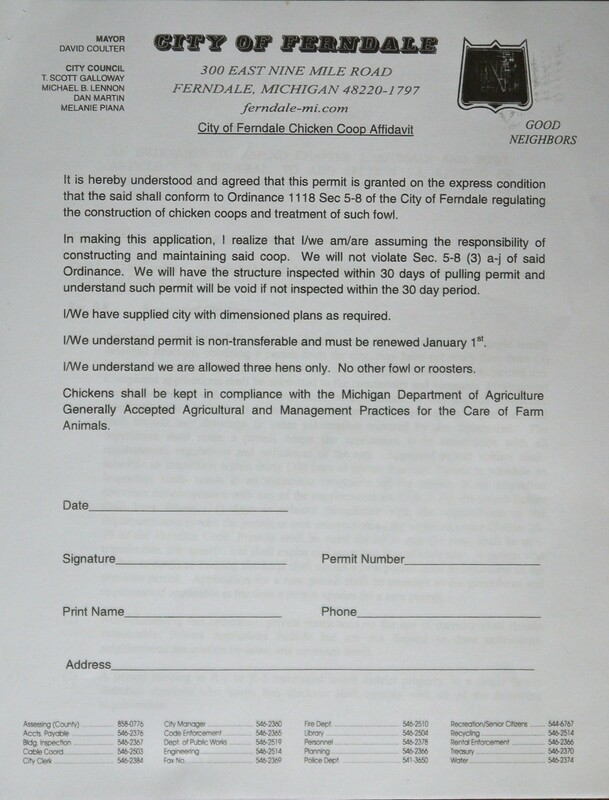 Permit will be void if inspection does not occur within 30 days. Keep no more than 3 hen chickens at any time. Roosters or male chickens and any other type of fowl or poultry are prohibited. Slaughtering of any chickens at the property is prohibited. 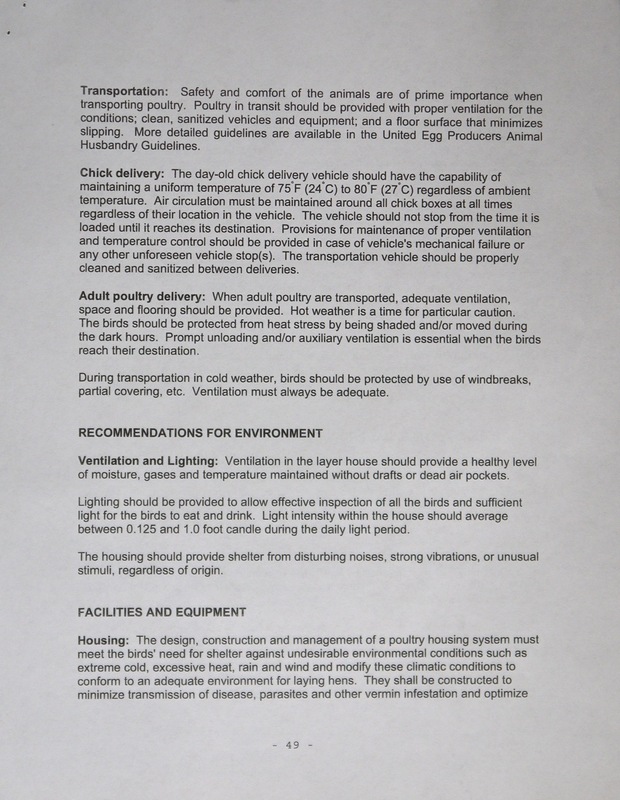 Chickens shall be maintained in a fully enclosed structure or a fenced enclosure at all times. 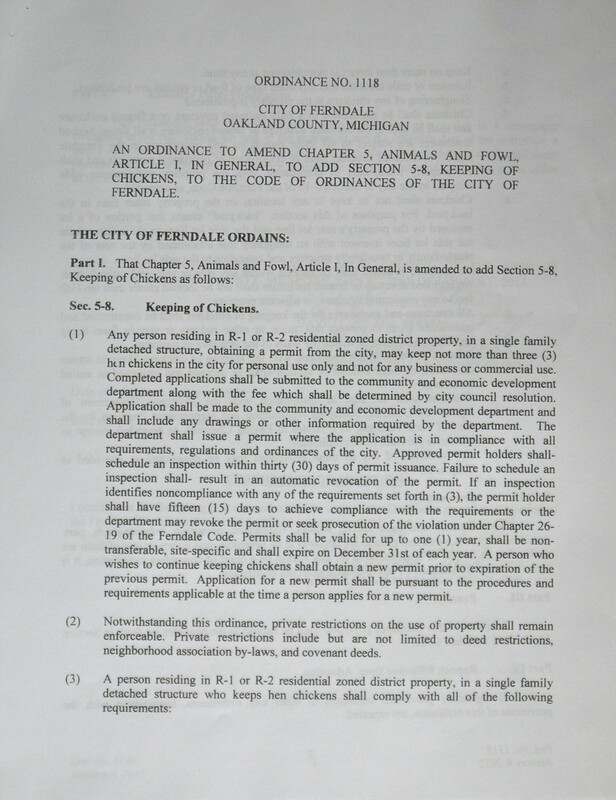 Fenced enclosures are subject to all fence provisions and restrictions in the Ferndale Code. 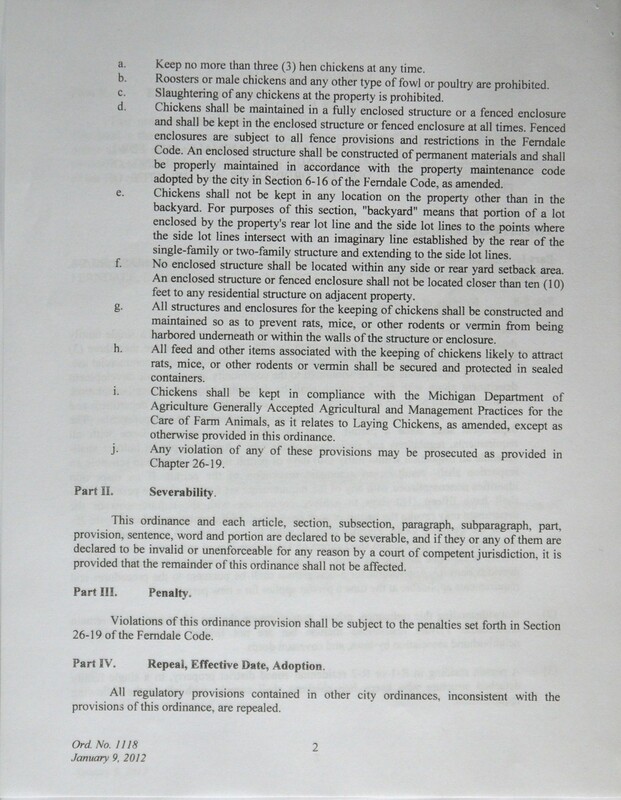 An enclosed structure shall be constructed of permanent materials and shall be properly maintained in accordance with the property maintanence codeadopted by the city in Sec 6-16 of of the Ferndale Code, as amended. 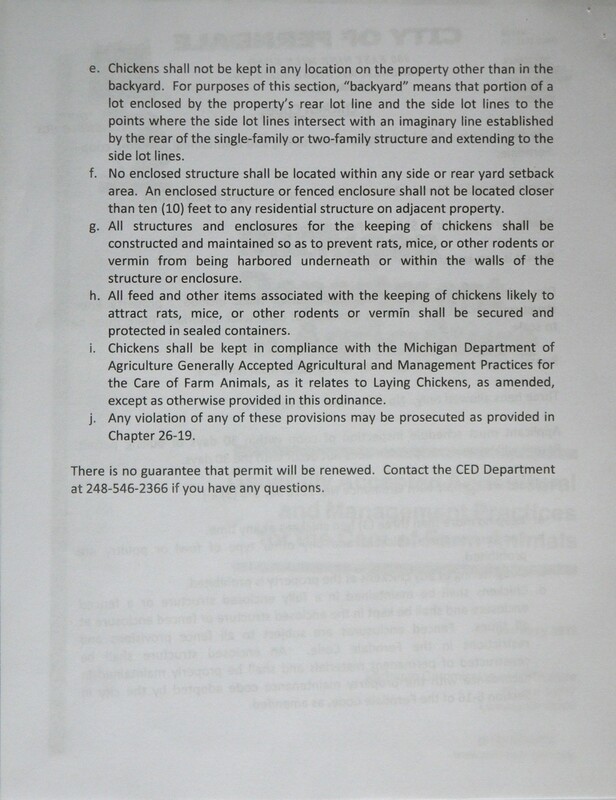 Chickens shall not be kept in any location on the property other than the backyard. For purposes of this section, “backyard” means that portion of the lot enclosed by the propertys rear lot line and the side lots lines to the points where the side lot lines intersect with an imaginary line established by the rear of the single family or two family structure and extending to the side lot lines. No enclosure structure shall be located within any side or rear yard setback area. An enclosed structure or fenced enclosure shall not be located any closer than ten (10) feet to any residential structure on adjacent property. 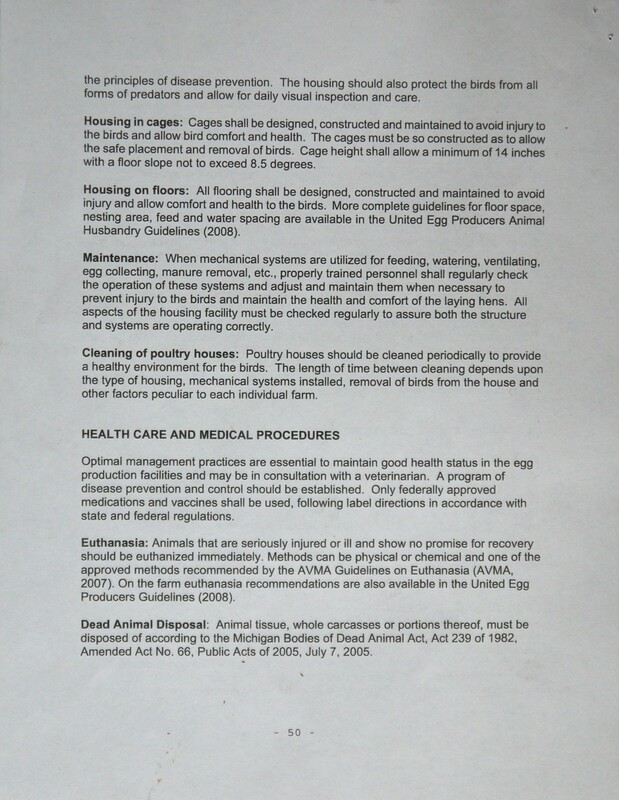 All structures and enclosures for the keeping of chickens shall be constructed and maintained so as to prevent rats, mice, or other rodents and vermin from being harbored underneath or within the walls of the structure or enclosure. All feed and other items associated with the keeping of chickens likely to attract rats, mice, or other rodents and vermin shall be secured and protected in sealed containers. 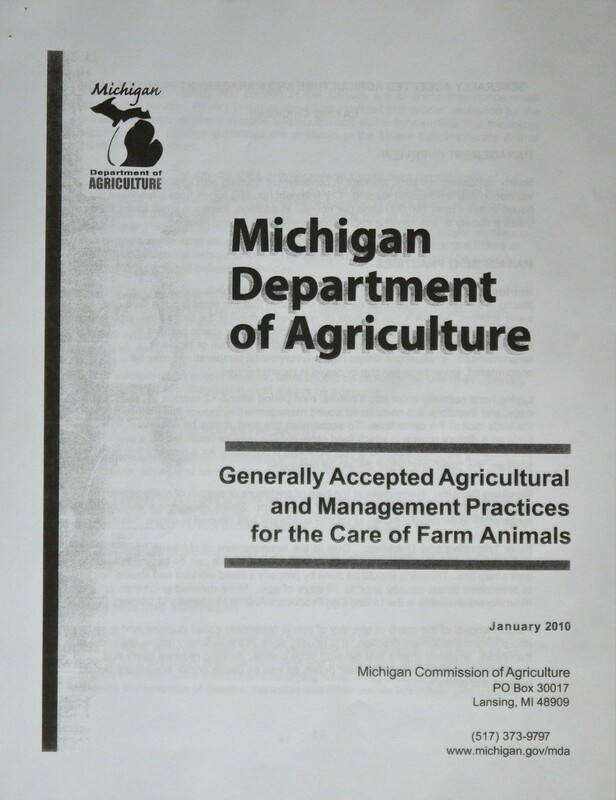 Chickens shall be kept in compliance with the Michigan Department of Agriculture Generally Accepted Agricultural and Management Practices (GAAMP) for the Care of Farm Animals, as it relates to Laying Chickens, as amended, except as otherwise provided in this ordinance. Any violation of these provisions may be prosecuted as provided in Chapter 26-19. My wife and I just moved to Ferndale. It appears our home has no zoning code. On Ferndale’s website, the map of our address is simply white, while about 5 houses east of us is zoned R-2. Does this mean we cannot have hens? Moving to Ferndale and raising hens has always been a dream of mine but I want to make sure we would be in compliance before I start building a coop. Sorry for the late reply! In your case, I would check specifically with the code enforcement office. If you’re surrounded by residential housing, you’re likely OK- but better to be safe than sorry. Hi there, I just moved to Ferndale last year and I was lucky enough to buy a home that came with a beautiful almost new chicken coop. I brought home 3 ISA Browns and I am loving chicken keeping! I would really like to get one or two pygmy goats. Does anyone know if this is possible in Ferndale? Any advice on fighting for my right to keep tiny adorable goats? Hello, I am moving into the area. Is there a map that shows what zones are where? I would hate to get a house in the wrong area!